Parents of autistic children face major challenges whenever they go outside. Here, a mother of autistic twins explains how she and her family cope when they leave the house – and what members of the public can do to help. 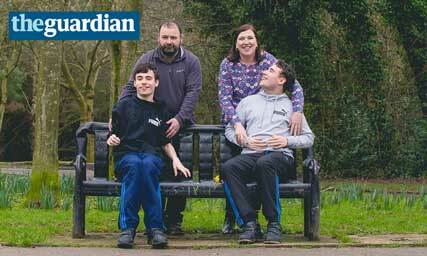 My husband and I have two autistic sons, 18 year old identical twins Nathan and Curtis. Taking them out and about is a big challenge. Both boys have severe learning difficulties and are non-verbal. Curtis also has attention deficit hyperactivity disorder, obsessive-compulsive disorder and was recently diagnosed with epilepsy. They are both 6’2” – not exactly kids any more. Neither likes busy places, sudden movements or unexpected noises like traffic or a baby crying.